Ugly when sleepy! ~ Live. Share. Inspire. I always thought I might have been stung or infected by a tsetse fly every time I feel so sleepy in class or at work. (tsetse fly? Yay!) No. no. There are days when I felt so sleepy at work that I’m having hard time concentrating. I had this just today. Perhaps, I have deprived myself again with a good night sleep when I stayed alert counting aftershocks and listening to the fast-paced beat of my heart every time I can feel the sway. What do I usually do when I get so sleepy? I stand up, walk around the office and back to my station. I go the CR and see an ugly Angie at staring the mirror with heavy eyelids and dark circles. Well, that’s the worst that you can get- sleepiness will exhaust the glow in you. Aside from this, the feeling is kind of frustrating because it’s interfering in my performance at work and slowed my responses. That’s bad. Here, I’ll share to you the things that we need to learn about daytime sleepiness. Why do you feel so sleepy? That so-hard to fight feeling of eye-lid meeting the other has becoming more a legitimate complaint according to National Sleep Foundation’s Dr. David G. Davila. You may have worked too hard that you purposely limit yourself to enjoy an eight-hour sound sleep. Perhaps you were assigned in a graveyard or rotating shifts that could affect your sleeping habits. Some may really have sleep disorders that disrupts sleep like sleep apnea or insomnia. In my case, I may got stuck with FB, blogging or chatting in the net to get latest updates on the recent quake. Actually, I slept 4am today. Who would not be drowsy in that case? So what if I don’t sleep? How do you know you have Sleep Problem? ③ You feel so sleepy during the day or you fall asleep unintentionally in inappropriate times during the day. ④ Your partner or spouse complained for your loud snoring, choking sounds and gasping while asleep; or that your legs or arms jerk often during sleep. ⑤ You feel a creeping, tingling or crawling feelings in your legs or arms while you sleep. ⑥ Sleepwalking and other unusual behaviors. ⑦ You feel like you can’t move your body when you first wake up. If you have experienced any of the above symptoms, don’t take it for granted. Seek medical assistance. 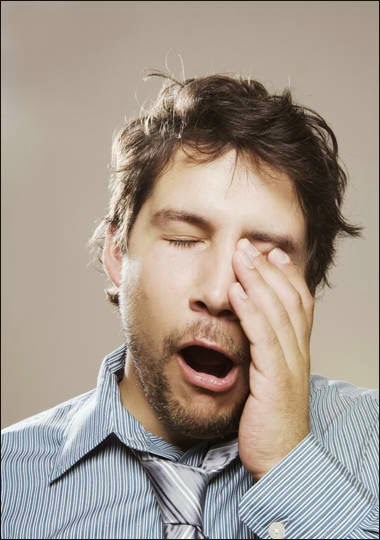 If you continue to be that “yawn-er” in the office, you may lose character and good standing. They might associate your yawning to signs of laziness and lack of motivation. Do you want that? So, cheer up! Exude that confident glow and stay alert and enthusiastic any time of the day.